The new show has been called "awesomely dreadful"
Television chef Nigella Lawson's ITV1 daytime show has lost 40% of its audience in the space of a week. 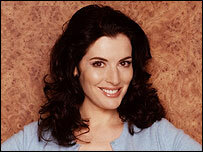 The first edition of Nigella on 4 July was seen by 800,000 viewers, while one million watched the second. But a week later audiences had slumped to 600,000. ITV has defended the programme, which goes out weekdays at 1330 BST. "It is going to take time to bed in," said a spokeswoman. "The audience has fluctuated slightly, but we have no plans to move it at this time." Guests on the show - a mix of chat, cooking and celebrities - have so far included DJ Terry Wogan, actress Brooke Shields and writer Stephen Fry. Next week's line-up includes actor Neil Morrissey and former breakfast TV host Eamonn Holmes. But critics have not been kind to the show, which has reportedly had problems attracting audiences to its recordings at the Capital Studios in south London. The Sun said it was "a strong contender for the worst programme concept in daytime TV history". The Observer, meanwhile, described it as "awesomely dreadful".